Soil degradation is clearly one of the most pressing problems facing man- kind. A continuation of soil degradation will eventually lead to a loss in crop productivity even though fertilizers and other inputs often result in increased yields in the short term. Soil degradation also leads to environ- mental pollution. A decrease in soil quality invariably leads to a decrease in water quality, and often in air quality. While there is a clear consensus that soil degradation is a major problem, the literature on this subject leaves numerous baffling questions. If statis- tics on land degradation are correct, there is a definite cause for concern, and present a mammoth challenge for agricultural scientists. There are those that say the scientific community has over dramatized this issue, and created a credibility problem. 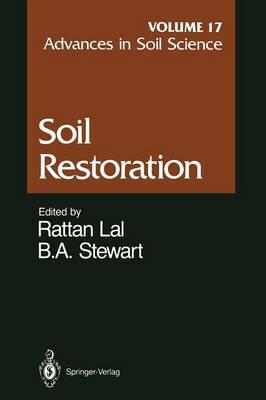 Consequently; Volume 11 of Advances in Soil Science was organized by Dr. Rattan Lal who is recognized as a lead- ing authority on the subject. The objective of Volume 11 was to assess the types and processes of soil degradation and establish some of the major cause-effect relationships. Volume II documented the seriousness of soil degradation in many parts of the world. Therefore, it seemed immediately important to devote a volume to the principles and technologies for restor- ing degraded soils to a productive status. While the land resources are limited, world population is rapidly increasing, particularly in developing countries. Dr.